The 2017 Hyundai Ioniq in Arlington is a top choice for buyers in the market for a fuel-efficient car. It's offered in one single platform, but is available with three different electric powertrains, benefiting drivers who want to maintain a "green" lifestyle. From its exterior design to its state-of-the-art technologies, the Ioniq is one impressive vehicle and it's bound to attract a series of new Hyundai fans. Aerodynamically speaking, the Ioniq is designed to perfection. It features a hatchback-style profile, fluid shape and crisp lines that enhance its appeal. The addition of a hexagonal-shaped grille also gives it a modern look, while its rear fascia sports a futuristic design. Read our 2017 Hyundai Ioniq review below for further details about its offerings. The best part about the Hyundai Ioniq is its variety of available models. New car shoppers can choose from the Ioniq Electric, Ioniq Hybrid and Ioniq Plug-in Hybrid. Each one comes with Apple CarPlay and Android Auto compatibility, and a 7-inch display screen. 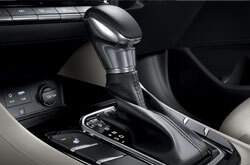 Hyundai Blue Link is optional and provides additional services, including diagnostics. 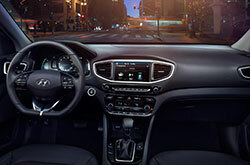 When it comes to the interior, the 2017 Hyundai Ioniq in Arlington is completely eco-friendly. The majority of the cabin is made out of recycle materials, including plastic, powdered wood and volcanic stone. 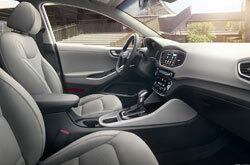 There's also a fuel-efficient "Driver Only" air conditioning mode for drivers to take advantage of. The Ioniq Electric is the only model that doesn't come with an engine. It uses a lithium-ion battery, and an electric motor that delivers 120 horsepower and 215 lb.-ft. of torque. This model offers an EPA-estimated 125 MPGe rating and offers a 110-mile driving range. 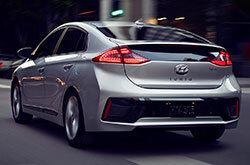 Both the Ioniq Hybrid and Ioniq Plug-in Hybrid receive a Kappa 1.6L direct-injected Atkinson engine that generates 104 horsepower and 109 lb.-ft. of torque. On the Hybrid model, the engine is matched with an electric motor that delivers 43 horsepower and 125 lb.-ft. of torque. 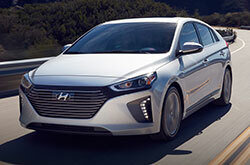 The Ioniq Hybrid Plug-in gets a 60-horspeower electric motor along with a lithium-ion battery and offers a 25-mile all-electric driving range. Many 2017 Hyundai Ioniq reviews have praised the car's safety technologies. There are plenty of driver-assist features available, including Lane Departure Warning, Automatic Emergency Braking with Pedestrian Detection, Smart Cruise Control, Blind Spot Detection and Lane Change Assist. Be sure to find out more about these features when you come see the new Ioniq at Vandergriff Hyundai. If you're not sure the 2017 Chevrolet Volt, Toyota Prius and the Ford C-Max are fit for you, then take a look at a 2017 Hyundai Ioniq near Dallas. Chances are that it entirely suits your full list of demands, with its wide selection of features and chic design from front to back. Now that you're nearly wrapped up with our 2017 Hyundai Ioniq review page, make sure to check out limited-time dealership incentives offered at Vandergriff Hyundai! 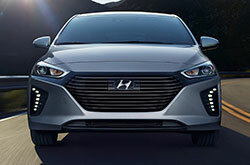 As your in-town Hyundai car retailer, we're the place to find finance offers on the Hyundai Ioniq, as well as other new and Carfax 1-Owner vehicles. We hope our 2017 Hyundai Ioniq review is helpful when you're all set to make your eventual buying decision. You can find Hyundai Ioniq inventory at Vandergriff Hyundai - we invite you to come in for a showing. Would you like to see it prior to your visit? It's no problem - looking at the included video recording will give you a peek at its full exterior from all angles.